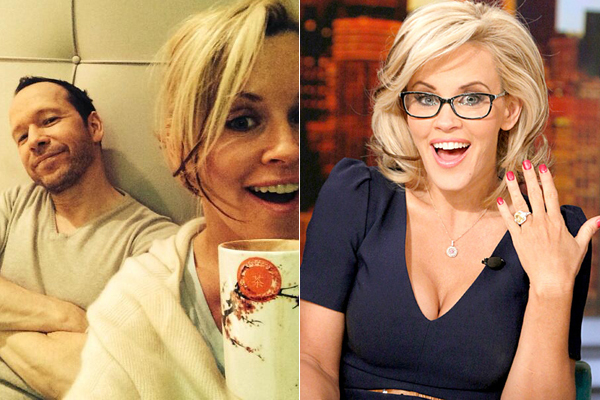 That’s right, your favorite “danger to public welfare” Jenny McCarthy is back in the news, but this time it’s more awwtism than autism (shut up). Despite her earlier protests that she would never again get married, the former host of “Singled Out” and star of a shoe commercial that depicted her with her underwear around her ankles just accepted a proposal from boyfriend Donnie Wahlberg, who was NKOTB’s bad boy if you believe NKOTB was capable of having such things. The individual-responsible-for-the-spread-of-preventable-diseases was thrilled to accept a substantial yellow sapphire rock from the individual-responsible-for-the-spread-of-boy-bands-like-One-Direction. Unfortunately, Wahlberg did not simply say “please don’t go, girl,” “you got the right stuff” and I want to be “hangin’ tough” with you forever (which, come on, would’ve been cheestastically awesome) but instead enlisted McCarthy’s son to hold up signs asking her to marry Donnie because that’s not emotionally manipulative at all. The how-are-these-two-not-irrelevant-by-now couple are planning an August 2015 wedding. We expect Debbie Gibson will officiate and the pair will exchange vows and his-and-hers snap bracelets. In happier news, Jim Carrey is somewhere breathing a sigh of relief and hoping this means the 2am texts will finally stop.